Solar power is an important investment and an electrical installation on your most precious asset, your home, so it’s essential to ensure you are dealing with an experienced, reputable company. At SolarSwitch, we specialise in home solar power installation. Over the last five years we have installed thousands of home solar power systems throughout NSW, the ACT, QLD, VIC and SA. You can view some of our Residential Solar Power Installations here. SolarSwitch work directly with the major multi-national solar panel manufacturers to offer you the best quality solar panels and inverters at competitive prices. We only install solar panels from reputable manufacturers with the 25 year output warranty held here in Australia, offering you complete peace of mind. Our partners include Suntech, Trina and SunPower, the latter offering the most efficient solar panel in the world. We use SMA inverters, the world leader in inverter technology, which is important as the inverter is the brains of the solar power system. SolarSwitch will not compromise on quality as this only leads to lost income, replacement costs and hassles for the homeowner. SolarSwitch offers full project management starting with a free home assessment where one of our expert assessors will answer all your questions and tailor a quality home solar power system to suit your individual needs. We also have payment plans available. SolarSwitch has its own Clean Energy Council (CEC) accredited electricians and we guarantee an experienced CEC accredited electrician will be on site and in charge of every SolarSwitch solar panel installation. That’s how we can offer an industry leading seven year workmanship warranty. Solar power can reduce your power bills, protect you against skyrocketing electricity prices, add value to your home and help the environment. Home solar power systems generally vary in size from 1kW up to 10kW, with the most common sizes being between 1.5 and 3kW. There are thousands of dollars in rebates available under the Solar Credits Scheme, so now is the time to act. SolarSwitch offer the solar power rebate as a high point of sale discount so you only pay the difference. Don’t wait for the shock of your next electricity bill, install solar power today. Looking for more ways to save? – Click Here! Since the 1970s, home solar power systems have been gaining popularity across Australia. Presently, an estimated 100,000 homes nationwide enjoy the benefits of safe and reliable electricity from solar power. Home solar power systems generally vary in size from 1kW up to 10kW, with the most common sizes being between 1.5 and 3kW. The number of solar panels in the system depends on the size, in watts, of each solar panel, for example 7 X 220 Watt solar panels make a 1.54kW system. You need approximately seven square meters of roof space per kilowatt for a solar panel system. The solar panels should produce approximately 4kWh (kilowatt hours) of electricity per day for each kilowatt of panels on your roof….e.g. if you have a 2kW solar power system on your roof it should generate approximately 8kWh per day of electricity depending on factors like location, roof pitch and orientation. The solar panels should ideally be placed on a North facing roof, or within 45 degrees of North, if not a West or East facing roof will still achieve good production. 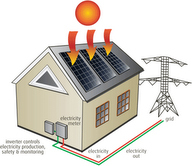 The process by which home solar power systems generate electricity is simple. When sunlight hits the solar panels on a roof, a DC electric current is produced. An inverter, connected between the solar panels and your switchboard, converts the DC current into AC current, which powers your home with any excess fed into the electricity grid. By creating your own clean green energy you are reducing the amount of electricity you need to buy from the power companies and hence saving money on your electricity bills. Take control of your electricity bills TODAY with the latest technology solar power system from SolarSwitch!